Enjoy a warm and good nights sleep after a tiring day with the Dreamz Fitted Heated Blanket. This electric blanket comes with a 100% polyester top which provides extra warmth and cozy throughout your forty winks. Featuring a dual-layer heating system (single layer for single size). 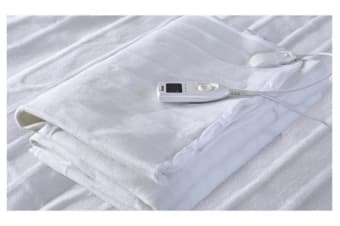 This heated blanket is perfect for those chilly winter nights. Do use as an underblanket. Do secure blanket to bed properly before use. Do only clean this blanket as specified in the instruction book. Do have this blanket repaired and/or tested by an authorised electrical agent. Do turn off and unplug when not in use. Do not use as an over blanket. Do not use tucked in, folded, rucked, bunched up or creased. Do not use with element or wired parts tucked in.Do not use it wet.Do not insert needles or pins into blanket. Do not use with damaged element or cables.Not to be used by persons insensitive to heat and other very vulnerable persons who are unable to react to overheating.